A kayak trip down the Semois river from Alle-sur-Semois to Vresse is the perfect option if you have never practiced this sport before or when you have some small children with you. It is also recommended for people who do not have the time to cover a longer distance. This 7-km option offers you the chance to explore the river peacefully at your own pace for roughly 1-2 hours. You will get to see unspoiled nature and typical landscapes creating a mood of peace and tranquillity. 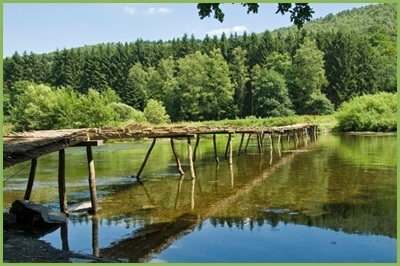 You will also encounter the picturesque “pont de claies” footbridge located in Vresse-sur-Semois (see picture). From 16 March to 15 June: between 9:30 am and 3:30 pm. From 16 June to 15 October: between 9.30 am and 4 pm. From 16 October to 15 March: between 9.30 am and 2 pm. Duration of the tour : approximately 1-2 hours. FOR THIS TRIP YOUR SHOULD ALWAYS REPORT TO KAYAKS LA VANNE – RUE LÉON HENRARD, 10 – 5550 ALLE-SUR-SEMOIS (BELGIUM)! WOULD YOU LIKE ANOTHER KAYAK TRIP?